There is no better way of countering oily, acne prone skin than the use of sandalwood face pack. Using it at least twice a week guarantees some amazing results. Khadi Special Sandalwood powder is a versatile natural treatment for face used also during worship and other auspicious occasions. The pack comes in a 50 gram package that weighs 3.2 ounces. It can be used for treating skin as well as hair. The metal jar is filled to the brim and is well secured to prevent the content from spilling over when you are traveling. Comes in a metal jar that has same color lid. All the information you need about the product is printed over the jar. It has a yellow brown face and its predominant smell is pure sandalwood scent. A mild but pleasing smell that does not bother anyone even sensitive noses. The powdery product has a soft texture. This is unlike homemade sandalwood powder. It is delivered ready to mix. The manufacturer recommends mixing it with plain water or rose water. It is easy to apply and it spreads easily on the skin. Feels cool and fresh on the skin. Its aroma is a delight to inhale. You will not feel a tingling sensation on your skin when you use it. It does not even harden nor tighten the skin when applied. It is recommended that you let it remain on the skin for 15 to 20 minutes and ensure it dries completely on your skin. It can be removed easily and it washes off easily with water leaving no residues. For the best results apply Khadi Special Sandalwood Powder twice a week for a month if you have acne or pimples. It reduces pimples and acne. Furthermore, its detoxifying capabilities help prevent pimples from reoccurring. It is ideal for all skin types even those with sensitive skin can use it. It helps keep the skin clean and healthy. 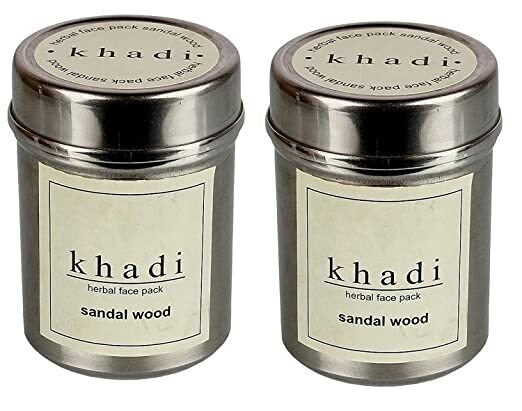 Khadi Special Sandalwood Powder does not stain the face when used as a face mask. The major ingredients in the product include fuller’s earth, turmeric, tulsi, and sandalwood powder. All these are ideal for treating skin problems. Has a smooth and soft texture. Effective in removing pimples and acne. Natural product with no side effects. Keeps the skin clean and radiant. It has all the required natural ingredients. Never makes the skin dry. Not tight enough for travel. You have to transfer into your own container.